Gerber had the big idea some time ago: Craft a handsaw with interchangeable blades and a handle wrapped in their famous Gator texture. But now they've upgraded the concept to be stronger than ever. With beefier construction and an improved blade exchange mechanism. 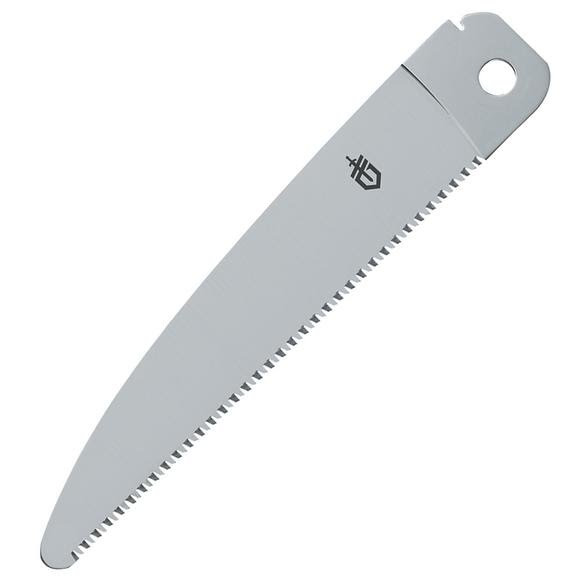 These saw blades are made of premium stainless steel, as is the blade channel. Gerber had the big idea some time ago: Craft a handsaw with interchangeable blades and a handle wrapped in their famous Gator texture. But now they&apos;ve upgraded the concept to be stronger than ever. With beefier construction and an improved blade exchange mechanism. These saw blades are made of premium stainless steel, as is the blade channel. Whether you&apos;re using the coarse blade for normal wood cutting or the fine blade for hardwood and big game bones, you&apos;re doing 1/3 less work when compared to other saws. The soft rubber overmolded Gator grip is a case study in how to make a saw easy to hold and effortless to use.